The Tulkarem office of the Palestinian Prisoners’ Society (PPS) has reported that Israeli soldiers abducted, on Thursday at dawn, a young Palestinian man in Tulkarem refugee camp, and searched many homes in Tulkarem city. The PPS said the soldiers abducted Khaled Burhan Abed-Rabbo, 28, after violently invading his home and searching it, in Tulkarem refugee camp. The PPS also stated that the soldiers invaded and searched many homes in Thannaba area, east of Tulkarem, and Ertah area, south of the city. 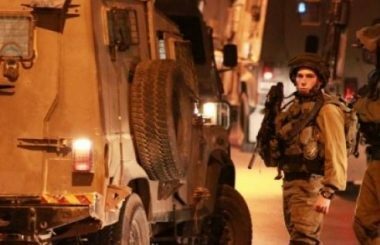 Also at dawn, the soldiers abducted a young Palestinian woman, and two men, during military invasions into homes, in different parts of the southern West Bank district of Hebron.